In early January of this year, the campaign of Indianapolis Mayor Greg Ballard filed its 2013 annual report with the Marion County Clerk's Office. The report suggests questions as to whether Ballard intends to go to the post in 2015 as well as highlights a continuing "burn rate" problem. Let's look at some comparable year reports which will highlight my point. In particular, I looked at reports that were two years before the election, outside the election window, when an incumbent is supposed to be raising money and stashing it away for use in the election window. Let's crunch the numbers. Ballard's two years out fundraising is down by 26.0% and spending is down 46.1%. The latter is not necessarily a bad thing as a candidate is not supposed to spend a lot of money in an off year. Former Mayor Peterson did it exactly correct in 2005, stashing away nearly 80% of every dollar his campaign brought in. Contrary to the belief that he is a prolific fundraiser, Ballard raised only 46.1% of what Peterson raised in a comparable year. Much of Ballard's spending has always gone to consultants. In the 2009 report, Ballard, for inexplicable reasons, paid Hallowell Consulting, run by Jennifer Hallowell, $92,857. That was down to "only" $52,000 in the 2013 report. Such large payments to Hallowell, who is married to Marion County Republican Chairman Kyle Walker, were always strange given her spotty record as a consultant. In 2007-2008, Hallowell acted as New Hampshire campaign manager for former New York City Mayor Rudy Giuliani. Giuliani finished fourth in the Granite State with only 9% of the vote. When Giuliani later dropped out,, Hallowell ran John McCain's campaign in Indiana. In 2008, McCain became the first Republican presidential candidate since 1964 to lose Indiana. 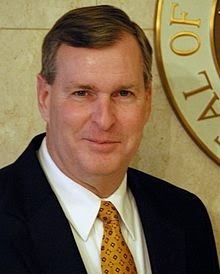 Most observers are certain Ballard will throw his hat in the ring for a third term. With former U.S. Attorney and Secretary of State Joe Hogsett waiting in the wings, I think a Ballard attempt at a third term in increasingly Democratic Indianapolis is far from a certainty. I'm sticking with the odds being only 50-50 that Ballard will run again.